The 92km, three-hour journey between Wellington and Picton is one of New Zealand’s most iconic tourist experiences and acknowledged as one of the most spectacular cruises in the world. From the dynamic hilly cityscape of Wellington Harbour out through the rugged rocks and steep cliffs above the Wellington Heads, this is a journey of spectacular contrasts. 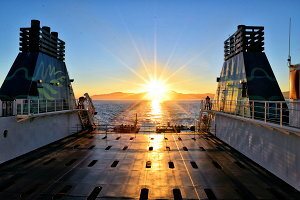 We strongly advise you take the ferry during the day to get a good view from the observation deck. It is an unforgettable journey. On a clear day, you can see the outline of the South Island as you depart Wellington. As you sail the short stretch of open water between Wellington Heads and Tory Channel, look out for dolphins, whales and other wildlife that often keep the ferries’ company. The route through Tory Channel in the Marlborough Sounds looks good from every angle. Rolling hills lushly covered with native New Zealand bush to the water’s edge, are dotted with the occasional remote holiday home. As you cruise Queen Charlotte Sound towards the pretty town of Picton, you’ll experience an area world-famous for its beautiful beaches, bush walks and great climate. 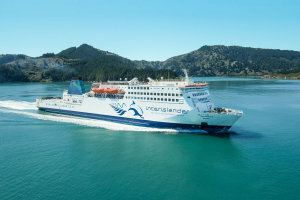 Interislander operates three ships: Kaitaki, Arahura and Aratere. Cook Strait ferries (Bluebridge company) operates only two ships: The Santa Regina and the Straitsman. Both ferry companies have the capability to transport vehicles making it easy to cover the whole country in one car or campervan. The season: it can be a bit more expensive to travel during the summer. The time of booking: generally, the earlier you book the cheaper it is. The time that you are travelling: a journey by night can be a bit cheaper but you will miss out on the beautiful scenery. Travelling with a vehicle: cars, campervan, motorbike and truck each have different rates. We have made a chart to help you understand the conditions of each fare. Please note that every fare includes the possibility to change the date of your trip, provided that there is available space. Also, if you change your departure date and the price of your new trip is higher, you must pay the difference.